Relationships | Lysa TerKeurst For all of their lives, my children have known a secret. When circumstances fall apart, there is a safe place. Their mom’s arms. More than a hug, this place beats with the gentle rhythm of a heart that feels what they feel. So they bring what they can’t bear to experience alone into this place. And we reconnect. So, when my daughter crawled into my arms at 3 a.m. several years ago, I knew. Trouble had found its way into her heart. A boy, whom she thought would handle her heart gently, didn’t. Her crush, crushed her. She felt it all so deeply. And while I could see it was all for the best, I hurt for her with her split-open heart, because she’s mine — my girl who couldn’t sleep, so she slipped into my bed to be near the rhythmic heartbeat she’s known since she was conceived. And she knew I was safe. Her safe place to run and find when the world got wild and cruel and heartbreakingly mean. The next morning, she showed me the source of her middle-of-the-night anguish: a text message from him. His words were from a heart entangled with immaturity and his own sources of hurt. He wasn’t a bad person. He was young. And sometimes young means incapable of handling situations the right way. I understand that. Age has given me that gift. But my young girl did not understand. She took the words like daggers to the heart. And cried. She handed me the phone. There we sat in the midst of poached eggs and toast crumbs, talking together, thinking together, replying together. Together is a really good word. Together is what we need when we hit tough patches in life. No matter what hard place we find ourselves in, feeling alone can make us vulnerable to bad decisions. Hard places can so easily make us want to default to our feelings rather than to wisdom as our guide. That’s not the best time to make a decision. Especially not alone. I suspect if you’re in a tough place, it probably feels more significant than a teenage heartbreak. I understand. I’ve been there. And I’ll probably be there again. And when we’re there, we have to be honest that we’re not in the place to make big decisions right then. Maybe we’re not even in the place to make decisions on simple requests from others. This doesn’t make you bad or incapable. It makes you smart. Smart enough to know to pause and take extra time when life takes on extenuating circumstances that are hard. In this pause from decisions, go to your safe place. When the world beats you down, open up your Bible. Let His sentences finish yours. Let truth walk before you like a guide on a dark path. And also go to someone in your sphere of influence whom you know is wise. How do we know whom to go to? The Bible makes it clear: “Who is wise and understanding among you? Let them show it by their good life, by deeds done in the humility that comes from wisdom” (James 3:13). Yes, let these wise people help you. Stand on top of their wisdom when you feel shaky with your own. When we can rise up on the wisdom of others and get a new view of our situations, our next steps seem a little clearer. Father, thank You for the help You surround me with — not only in Your Word, but also with the people You place in my life. Give me the wisdom to reach out for help when I need it. And make me aware of those around me who are hurting and could use Your hope. In Jesus’ Name, Amen. The party sounded amazing. The people I’d heard were going are easy to be with, incredibly fun, and all have mad skills in the kitchen. And when I saw the invitation posted on a friend’s refrigerator I smiled at the creative brilliance. The only problem was I didn’t get one. I’d been checking my mailbox for days. Every time I walked back down the driveway empty handed, I kept assuring my sinking heart that because we live in the country my mail is always a day or two or even seven days behind everyone else’s. No big deal. But three days before the party when the invite still hadn’t arrived I ran out of assurance. I lost the pep in my rally. And I realized I was, in fact, not on the guest list. When I ran into one of the hostesses later that day I lobbed out the equivalent of a Hail Mary throw in the final seconds of a game, “What do y’all have going on this weekend?” And then I felt as pitiful as the quarterback who watches the opposing team take what would have been his shining star moment and turn it into an interception. And that’s when the hardest of all the realizations hit me. Read more from my post over at (in)courage today by clicking here. I don’t know who made up the saying, “Sticks and stones may break my bones, but words will never hurt me.” Either they had nerves of steel, or they lived on a deserted island with no other people. Because not only do words hurt me but they make me want to fight back and be mean, too. Colossians 3:12-14 reminds me, “… as God’s chosen people, holy and dearly loved, clothe yourselves with compassion, kindness, humility, gentleness and patience. Bear with each other and forgive one another if any of you has a grievance against someone. Forgive as the Lord forgave you. And over all these virtues put on love, which binds them all together in perfect unity” (NIV). Finally, Colossians 3:17 reminds me, “And whatever you do, whether in word or deed, do it all in the name of the Lord Jesus, giving thanks to God the Father through him” (NIV). 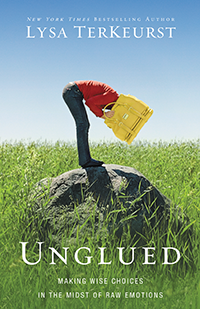 Gain a deep sense of calm by responding to situations out of your control without acting out of control with my book Unglued. You can get your copy here.